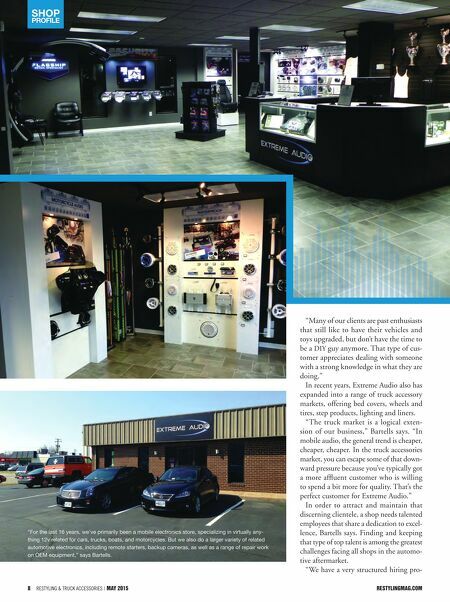 restylingmag.com May 2015 | Restyling & tRuck AccessoRies 9 cess that definitely helps to weed out the bad matches, but getting that list to draw from can sometimes be difficult," he says, noting that the company utilizes tools, like personality testing, to take some of the guess work out of the process. "Structuring our hiring process to take a lot of the opinion out of it has helped quite a bit with potential new hires," Bartells says. "In the past, you practically knew if you were hiring someone within 30 sec- onds, but that gut feeling doesn't work out that often." Reputation and Promotion is King Ask Bartells about the best tool for attracting and retaining talent, and the answer is quick and simple: Reputation. "Thankfully we've built our company to be a place that people want to work," he says. "Most veterans in the industry like the way we do things and seek us out when openings arise. This has led to the best crew we've ever had, with a diverse range of experience covering all the bases." "Making that transition from competitor and enthusiast to being a business owner isn't always easy, but for me it's been a lot of fun," Bartells says.